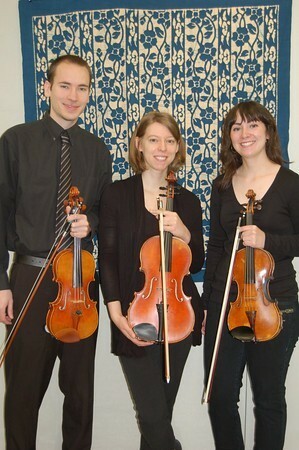 Terzetto is a classical string trio consisting of 2 violins and a viola. The focus of the performance will be Dvorak and “Melody”. Kelsey Platt is from Appleton, Wi. She completed her undergraduate studies with Samantha George at Lawrence University. She graduated with a Bachelor of Arts degree in English and a Bachelor of Music degree in Performance. She is currently pursuing her DMA at the University of Iowa, studying with Katie Wolfe. Kelsey has participated in summer musical festivals in the US and France. Tim Cuffman is currently pursuing a Doctor of Musical Arts degree at the University of Iowa as a student of Scott Conklin. He holds a bachelor’s degree in Violin Performance from the University of Akron, where he studied with Alan Bodman. As a student of Stephen Miahky, Tim earned masters degrees in Violin Performance and Upper String Pedagogy from Ohio University. Megan Gray is currently pursuing her Doctor of Musical Arts in Viola Performance and Pedagogy at The University of Iowa where she is the teaching assistant under Christine Rutledge. Megan also holds a Masters of Music from the University of Iowa and a Bachelor of Music from Virginia Commonwealth University where she graduated with academic honors under the guidance of Dr. Alice Lindsay. Her methods involve combining the interdisciplinary world of music, cognitive science, and neurology.